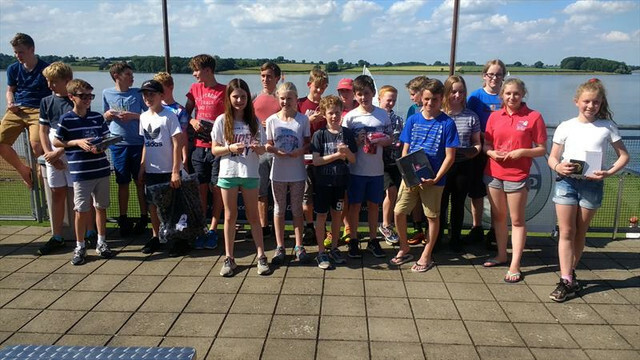 80 Toppers descended upon Rutland SC last weekend for round 5 of the 2016-17 Volvo GJW Direct Topper National Series. After a succession of windy national events, the advance forecast this time was predicting generally light winds over the weekend, and therefore a chance for the smaller sailors to shine! Saturday dawned with glorious sunshine amidst the 1976-beating June heat wave, and after the usual controlled chaos of registration and briefings, the 180 sailors were tallied and launched on schedule, and headed off to their respective race areas, with the 5.3s a couple of miles away towards the dam. Although light, the wind was thankfully reasonably steady at around 240 degrees, just occasionally flicking right and funnelling along the north of the peninsular but always returning. With 150 boats, the 5.3 fleet was as usual split into 4 flights, but nonetheless with 75 Toppers on each start-line it was inevitably pretty busy and competitive, and some 16 starts were required to get the 8 flight-races away, with the numerous general recalls requiring appropriate use of the black flag! Consequently, and perhaps inevitably in these light conditions, it did not prove possible to complete the full schedule of 5 races (10 flights) within the 6-hour guideline, but the race officer did well to complete 4, allowing the first discard to kick in. The day's race winners were Sam Jones and Lorcan Knowles with two victories each, with Sonia Evans, Andrew Homer, Toby Pearce, and Finlay Tulett each taking one win. Meanwhile the 29-boat 4.2 fleet raced a little closer to the club, in perhaps slightly more fickle conditions, but nonetheless completed their full schedule of 5 races. The day was dominated by 10-year old Tom Thwaites, following on from his debut event victory at Grafham, winning 4 of the 5 races, and beaten only by Archie Burton in race 3, but with a good variety of runners up including Tim Evans, James Smaggersdale, Bjorn Handley and Ceri Roberts. As everyone packed up on Saturday evening the wind forecast for Sunday had already dropped to a barely viable 5-6 mph, but in the event even this failed to materialise. After a two hour postponement, looking out over a glassy reservoir, the wind began to tease and the rippled areas began to spread, and the generally reluctant sailors were tallied and launched at 12.30 for the slow procession out to their respective race areas. The 4.2s inevitably got away first, and were well into their second lap when the decision was made to abandon racing for the day, whilst the 5.3s had barely got the second flight away before the same inevitable outcome. The overall results therefore remained unchanged from the overnight standings in both fleets. At the front of the 5.3 fleet Sam Jones and Lorcan Knowles were tied on 4 points with identical race scores, with Sam taking the event on count-back. Scott Wilkinson took 3rd and George Vincent 4th, Sonia Evans was 1st Girl in 6th overall, Andrew Homer took 1st Youth, and Ella Spain won the Optimum Time Endeavour Trophy (a big yellow race watch!) for the lowest placed boat to complete all races. In the 4.2s Tom Thwaites took a convincing second consecutive event victory, with Tim Evan's consistent score-line securing a safe 2nd overall, followed by Daniel Perkins and Ceri Roberts. Ciara Woodard won 1st Girl in 9th overall, with the 4.2 Endeavour Trophy and race watch going to Isabella Ferneyhough in her maiden national event. Thanks as usual go to the hoards of volunteers who enable these big events to happen, to the excellent race management and safety teams on both courses, and to our hosts Rutland SC for coping admirably with another Topper mass invasion! Next stop is the Royal Norfolk and Suffolk YC in Lowestoft (15-16 July) for the final round of the 2016-17 National Series (and the 2nd 2017-18 RYA and ITCA Squad Selector), and then for many it is promptly off to Lochtudy in Brittany for the Worlds (22-28 July, 195 Toppers already pre-entered including 32 from Ireland and 43 from China! ), before heading to Pwllheli for the Nationals. A busy period ahead, and entries are still open for all these events for those who have not yet committed! Harken UK are proud to be a supporting partner of the Topper fleet, helping develop the next generation of sailors.